What is the price of dissent in the world’s largest Democracy? It could be displeasure, it could be anger or it could even be someone’s wrath but could it be death? Surely it could not be death; it should not be death. So, would have been my guess, your guess, Sri Ramalingam’s guess. Only in his case the guess was wrong and he paid the price of his dissent by losing his life. Sri Ramalingam was working as a caterer. 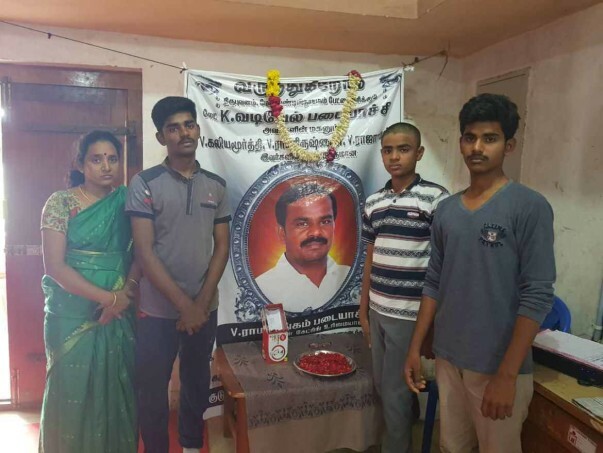 On 5th Feb 2019, he had gone to Kumbakonam to pick up a few workers Kumbakonam in Thanjavur for his catering business. At Kumbakonam he came across a group of men who had no regard for communal harmony. Sri Ramalingam being a rational and brave Indian dissented with this group in a respectful manner for he did not want people to be divided. However, his peaceful dissent was met with a violent rebuttal that ended in his murder at the hands of his dissenters. The death of the primary earning member pushes his family back by many years. The goal of this campaign is to raise INR Ten lakh for the immediate assistance of Shri Ramalingam’s family. The money collected will be transferred to Mr Ramalingam wife’s account as soon as the goal of this campaign is met. We are making a downward revision to the target of this campaign to INR 45 lakh in view of the reduced donations. We are in discussion with Milaap and an esteemed donor for setting up a trust for the family and will keep our donors posted on the developments. The first tranche of funds raised - Rs 19,40,026 was transferred on Feb 13th 2019. Please find attached a picture of the statement attached below in this update. This statement was made available only after the family authorized the bank branch to share with us. The a/c no. can be seen on top left corner of the statement. Sri Ramalingam aged 42 was working as a caterer, hiring cooking vessels and other amenities like Shamiana etc. 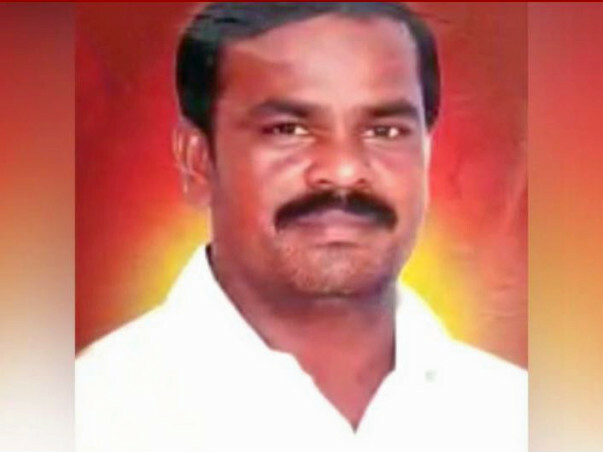 He had his own business operating across TN, Karnataka and Kerala. .
On 5th Feb 2019, he had gone to Kumbakonam to pick up a few workers for his catering business. The same day evening he was murdered Ramalingam was the sole earning member in his family. He has 4 dependents – his Wife and 3 young sons. His wife was helping him in his business needs. 2nd son studying in 10th Std and 3rd in 9th Std. They have their own house and has no loans. Major concerns for the family as mentioned to our team. Their eldest son is the only witness to Ramalingam’s murder. His mother & relatives are very concerned about his safety and security. The family has been provided security by the local police. The family is very grateful for the wonderful support that you have shown. The funds will be used to support the family and the kids' education. Photography was permitted only inside the house citing security reasons. A donor, who wishes to remain anonymous (and verified by Milaap), has reached out to the campaign organizer, the family and Milaap to help with structuring the funds raised to save on taxes and ensure family earns a steady income. The family is aware of the fundraiser and contact details of campaign organizer (Mr Ashutosh) and Milaap. We'll transfer the next tranche of funds to the account immediately upon receiving the family's request to do so, keeping the campaign organizer informed. We have been getting many queries on the disbursal of the funds. We wish to assure our donors that your donations are safe. Earlier today, we disbursed Rs. 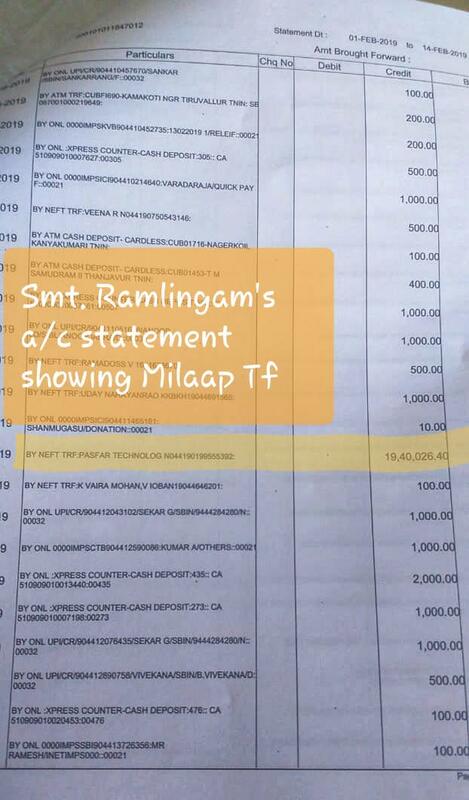 19 lakh 40 thousand to Smt Ramalingam’s account. We are still keeping the USD amounts with Milaap and will make a consolidated transfer when the campaign reaches the target.